J Pain Symptom Manage. 2014 Oct;48(4):510-7. 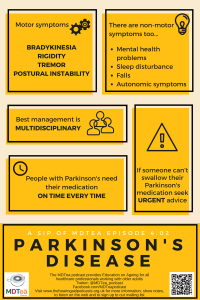 Firstly – we are going to talk about idiopathic Parkinson’s disease – we are not going to talk about other forms of parkinsonism or the so called Parkinson plus syndromes. We are planning a mini-series to explore in more detail the broad topic of PD. Probable best done chronologically – and will take most of the episode! In the mid-1800s, Jean-Martin Charcot was influential in refining and expanding this early description and in disseminating information internationally about Parkinson’s disease. Also that there seemed to be ‘typical’ and ‘atypical’ cases. Importantly he noted bradykinesia as a key cardinal feature. The two most commonly noted problems are: slowness of movement (difficulty walking) and tremor. Referrals therefore can come from a number of places – e.g. doctors, PT’s, OTs, SaLT etc. 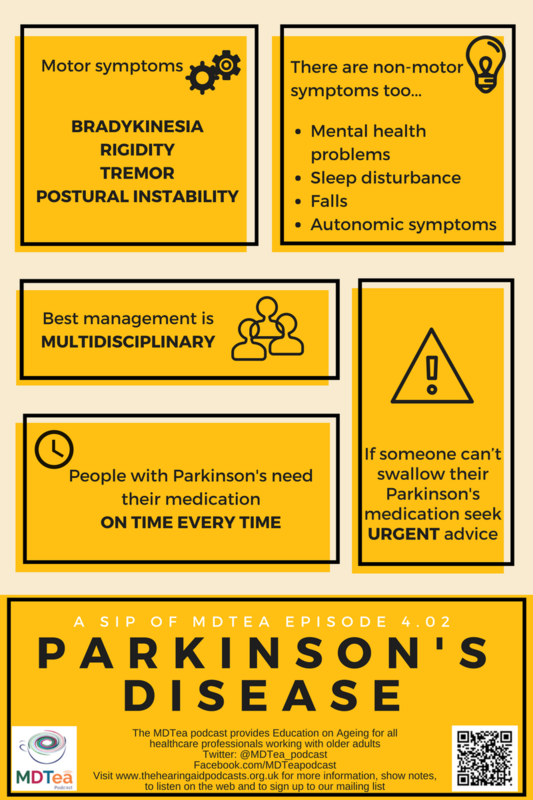 NICE guidelines says: PD should be suspected in people presenting with tremor, stiffness, slowness, balance problems and/or gait disorders. For the actual diagnosis of Parkinson’s Disease working through the brain bank criteria I think gives a good practical thought process for making a diagnosis. This is quite a specialist thing really and at this point you should refer your patient – untreated to a specialist clinic. Progression through the stages is variable – based on a study of 695 patients with PD. (Cox regression analysis revealed that older age-at-diagnosis, longer PD duration, and higher Unified Parkinson’s Disease Rating Scale (UPDRS) motor scores at baseline were associated with a significantly faster progression through various H&Y stages). When a decision by the higher brain centers is made to perform a particular action, the inhibition is reduced for the required motor system, thereby allowing movement to happen. Dopamine acts a the neurotransmitter to facilitate this release of inhibition, so high levels of dopamine function tend to promote motor activity, while low levels of dopamine function, such as occur in PD, demand greater exertions of effort for any given movement. In PD there is an accumulation of alpha synuclein which leads to cell death (particularly in the basal ganglia and substantia nigra). Thus, the net effect of dopamine depletion is to produce hypokinesia, an overall reduction in motor output – e.g when walking. Now the treatments therefore all provide more dopamine in one way or another. So when a patient has the drugs they can move around better – as the drugs wear off they can’t. The drugs work by and largely dose to dose – so when it wears off it is not working at all – so the timing of drugs is really important. The patient / relatives will know when they take their treatment – its best not to fiddle with these timing and work towards the patient and not your / out system. If they needs drugs at 06:45, or 08:50 or 13:15 then find a way to give them then – don’t just stick to the drug round times. If they can’t swallow don’t just do nothing – ask for advice urgently from someone that can give it (e.g doctor / pharmacist / PD nurse etc). However it’s not all just about the movement… there are non movement symptoms too! An appreciation of these has occurred over the last 30 years. Typical antipsychotic drugs (such as phenothiazines and butyrophenones) should not be used in people with PD because they exacerbate the motor features of the condition. Rapid eye movement (REM) sleep behaviour disorder in people with PD and sleep disturbance. Sudden onset of sleep should be advised not to drive and to consider any occupational hazards. Attempts should be made to adjust their medication to reduce its occurrence. So who needs to be involved in looking after people with PD? which may be provided by a Parkinson’s disease nurse specialist. The Alexander Technique may be offered to benefit people with PD by helping them to make lifestyle adjustments that affect both the physical nature of the condition and the person’s attitudes to having PD. cognitive assessment and appropriate intervention. review and management to support safety and efficiency of swallowing and to minimise the risk of aspiration. Patients with PD should be assessed under the principles of the care act – and are entitled to appropriate support from social care services. The charity sector (in particular Parkinson’s UK) are very helpful in this regard and the PD UK website has a wealth of information on the area. The findings indicate how maximising quality in social care delivery for people with Parkinson’s disease can impact on health and well-being. Long-term or short-term benefits may result in prevented events and reductions in health and social care resource. Health professionals can be instrumental in early detection of and signposting to social care. Weintraub D, Burn, DParkinson’s Disease: The Quintessential Neuropsychiatric Disorder. Mov Disord. 2011 May; 26(6): 1022–1031. Recognises, assesses and manages patients with long term conditions.